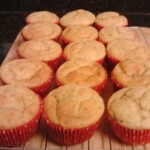 The most fluffy cupcakes I’ve ever baked! Ingredients for cupcakes. Makes 18. 1 ½ cups all-purpose flour. 1 ½ teaspoon baking powder. 1 big mashed very ripe banana. 9 oz milk chocolate, finely choped. Preheat oven to 350º F and line two standard cupcake pan with paper cupcake liners. In a bowl, beat butter and sugar together with a whisk or electric mixer until fluffy. Add eggs one a time, beating well after each addition. Sift flour, baking powder and baking soda over the mixture and mix. Add mashed banana, sour cream and the milk and mix until combine. Using two spoons, fill about ¾ of each paper cupcake liners. 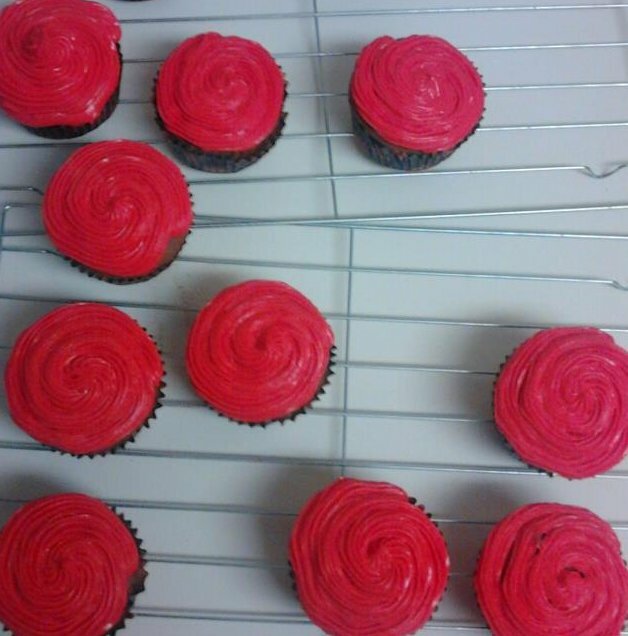 Bake for 18 to 22 minutes or until a toothpick inserted in the center of a cupcake tests clean. Combine chocolate and heavy cream in a sauce pan. Stir over a low heat until smooth. Cool to room temperature before use. Spread chocolate ganache over cooled cupcakes and top with a dried banana chip. The most famous American Pie! 2 ½ cups all-purpose flour. 1 cup (or 2 sticks or 8 oz) very cold margarine, cut in small pieces. Combine flour, salt and sugar in a bowl. Add 1 tablespoon of ice water a time and mix with your hands until you have a compact dough. Split the dough in 2 pieces. Put each dough in plastic wrap and put in the fridge at least 1 hour, up to 2 days. Peel the apple, core it and cut in slices. In a bowl, add apples, brown sugar, granulated sugar, butter, flour, cinnamon, butter, salt, nutmeg, and lemon zest. Stir all the ingredients and cover the bowl with plastic wrap. Preheat oven to 390º F.
Remove one dough from the fridge and let at room temperature at least 10 minutes in order to soften. Spread flour sprinkles over a surface and put the dough. With your hands make a circle. Using a rolling pin spread the dough circle. The dough should be bigger than the pie plate. Roll in in the rolling pan the dough and then roll out over the pie plate. Press the pie dough down and to sides. 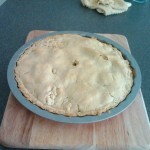 Using scissors, trim the dough about 2 inches from the edge of the pie plate. 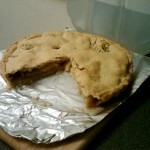 Remove from the fridge the filling and fill the pie. 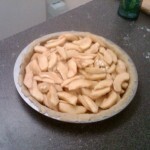 Put in order the apples to fill all space inside the pie. Remove the second dough from the fridge. Spread flour sprinkles over the kitchen surface and put the dough. Make a circle with the dough. Using a rolling pin, spread the dough circle. Roll in the dough in the rolling pin and roll out to cover the pie. Using your hands, seal the edges of the crust. Cut a small hole on the top of the crust to vent. Put in the oven for 50 to 55 minutes. 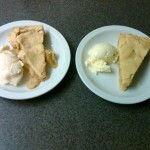 I love apple pie slice with two vanilla or butter pecan ice cream! Yummy ! Apple pie with one vanilla ice cream scoop. 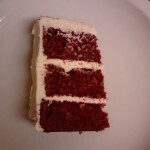 Here the recipe to bake a yummy red velvet cake! 1 tablespoon red food coloring. 16 oz cream cheese at room temperature. 2 ½ cups confectioners’ sugar. You can make your own buttermilk adding 1 tablespoon of white vinegar to 1 cup of whole milk. After 15 minutes, you’ll have buttermilk. Preheat oven to 355º F.
Stir in a bowl flour, baking powder, baking soda and cocoa powder. and mix using a whisk. In a different bowl mix butter with sugar until creamy. Add the vanilla extract and eggs, one a time, and beat until mix. Add red food coloring to buttermilk. Be careful with stains! It’s very hard to leave from clothes! Add dry ingredients from the first bowl (flour, baking powder, baking soda and cocoa powder) in 3 times, alternating with buttermilk, and beat. Put in a round cake pan. 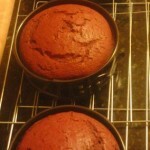 or in two small round cake pans. Put in the oven about 40 to 45 minutes or until a toothpick inserted in the cake tests clean. Beat the cream cheese until creamy in a bowl. Add butter and vanilla extract and beat. Finally, add confectioners’ sugar and mix well. Cut the cake horizontally in 2 pieces. If you’ve baked it in two cake pans, don’t have to cut it. Spread the top of first layer with frosting using a spatula. Add the second layer and spread more frosting. 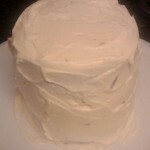 Then, spread the cream cheese frosting to cover the entire cake. Keep refrigerate for 4 hours. You can bake cupcakes instead a cake. Put a cupcake pan and fill paper cupcake liners with the batter using two spoons. Put in the oven for 20 to 25 minutes or until a inserted toothpick tests clean. Use cream cheese frosting to decorate cupcakes. 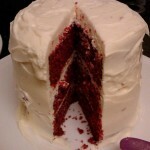 3 layer Red Velvet cake. This is a traditional pie for Thanksgiving day! 1 ¼ cups pumpkin purée. You can use caned pumpkin purée. Using scissors, trim the dough about 1inche from the edge of the pie plate. Cover with plastic wrap and keep refrigerated. In a medium-size bowl, combine pumpkin purée, sugars (granulated and brown), salt, ginger, cinnamon, and flour, and mix until combine. In small bowl, combine eggs, cream, milk, and vanilla, and beat lightly to mix. Pour the egg mixture into the pumpkin mixture, stirring to blend. Remove the pie shell from fridge and pour the filling into the shell. Bake for 50 to 55 minutes or until the filling is almost set. The center should still look slightly undercooked. Stop the oven and keep inside for 5 minutes. Residual heat will continue to cook the filling. Remove from the oven and let cool at room temperature before enjoy! 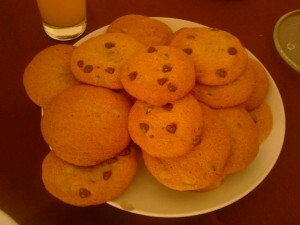 Here the recipe to bake 2 dozens of chocolate chip cookies! Enjoy! 2 ¼ cups all-purpose flour. ¾ cup semi-sweet chocolate chips. In a bowl, combine dry ingredients ; flour, salt and baking soda. Then, set aside. In a new bowl, combine brown sugar, softened butter, granulated sugar and vanilla. Beat until creamy using a whisk or electric mixer. Add eggs one a time and just mix. Stir in chocolate chips and mix. Using two spoons, drop mixture in small scoops over a greased oven tray. You can put some chocolate chips over the scoop before put in the oven. 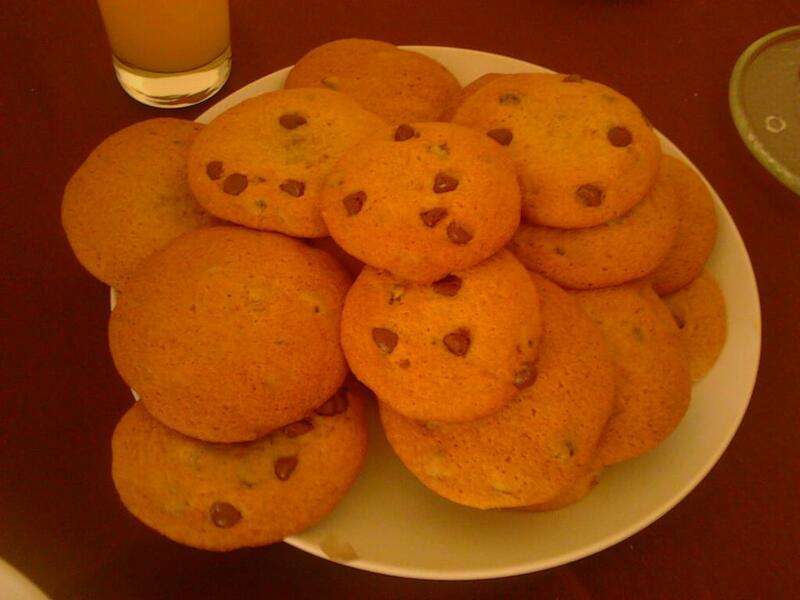 After bake, you’ll have chocolate chips’ topped cookies. The cheesecake is one of my favorite cakes. This is an American recipe for a wonderful cheesecake. ½ (or 4 oz) cup butter. 1 ¾ cups finely crushed graham crackers. 4 cups (o 32 oz) cream cheese. 1 ¼ cups superfine sugar. 2 egg yolks at room temperature. 1 ¼ cups heavy cream. Place a small saucepan over low heat and add the butter. Heat until butter melts and remove from the stove. Stir in the melted butter the crushed graham crackers and granulated sugar and then mix. Put the mix in a round cake pan and press tightly into the bottom. Put the cake pan in the oven and bake for 10 minutes and then, let cool in a wire rack. With a electric mixer, beat the cream cheese until creamy in a bowl. Add gradually sugar and flour and beat until smooth. Increase the speed beat in the vanilla extract and add the eggs and yolks one a time. Finally, beat in heavy cream using the mixer‘s fastest speed. The mixture will be light and creamy. Grease the sides of cake pan with butter, pour in the filling and smooth the top. Bake the cheesecake for 15 minutes. Reduce the temperature to 200ºF and bake for additional 30-40 minutes. Turn off the oven and let the cheesecake inside for 3 hours to cool. 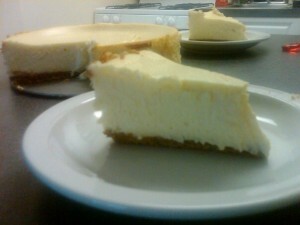 Put the cheesecake in the fridge and refrigerate overnight. You can use Oreo cookies for a chocolate base instead of graham crackers. You have to remove the cream filling from the cookies! It’s Halloween time! 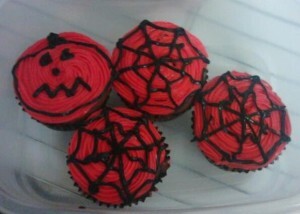 You can bake several cupcakes using official Halloween colors ; orange and black. 2 teaspoons pumpkin pie spice. ¼ cup unsweetened cocoa powder. 9 oz of cream cheese, chopped, at room temperature. 1 ½ cups if confectioners’ sugar. Orange (or red + yellow) food coloring. Preheat the oven to 350º F and line a standard cupcake pan with paper cupcake liners. Put the softened butter and sugar in a bowl. Using a electric mixer, beat the butter and sugar until fluffy. Beat eggs, one a time, until combine. In a different bowl whisk together the flour, baking powder, spices and cocoa powder. Add the second bowl to the butter mixture in two batches alternating with milk mixing to form a smooth batter. Bake for about 25 minutes or until a toothpick inserted in the center of a cupcake tests clean. To cool, transfer to a wire rack. In a bowl, beat cream cheese and confectioners’ sugar with a electric mixer until smooth. Separate 2 tablespoons of frosting in a small bowl. Add orange (or red and yellow) food coloring to the big bowl to make a orange frosting. Add black food coloring to frosting’s rest. Fill a pastry bag with orange frosting and decorate each cupcake using your favorite pastry tip. Fill a pastry bag with black frosting and make the details. You can use several candies to top the cupcakes. You can fill the cupcakes with pumpkin butter. Yummy! Brownie. Image source : Wikipedia. 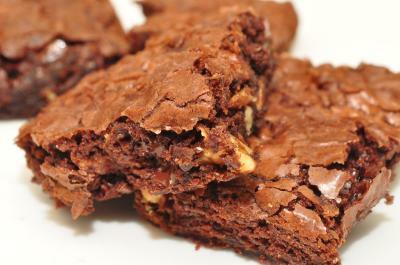 Brownie is a popular chocolate kind of cake. You can eat it with coffee, milk or vanilla ice cream. 1 cup (2 sticks or 8 oz) unsalted butter. 2 ¼ cups granulated sugar. 1 ¼ cups cocoa powder. Preheat your oven at 350º F and grease a square 9” x 13” cake pan. When the butter is melted, add the sugar and stir until combine. Then, let it cook for another 2 minutes, stirring. Put the mixture in a bowl. It should be thick. Add the eggs, cocoa powder, salt, baking powder and vanilla extract to the bowl. Mix well until combined. You can use a whisk or a electric mixer. Add the flour and mix with a silicone spatula until combine. Stir with whisk for 1 or 2 minutes. Optional. Add chocolate chips and/or pecan nuts and stir until well combined. Bake for about 30 minutes. To know if the brownie if ready, you can insert a toothpick. If it comes out semi-clean, it’s ready. Cut in pieces of about 2 inches. In a plate, put 2 pieces. Put the plate in the microwave 20 seconds. Introduce yourself is the most common expression in Language ETC school at the beginning of each term. My name is Andrés. I usually live in La Roca del Vallès, a small village near Barcelona. In March 2012 I moved to Bethesda, Maryland, and few weeks later I began to study English in Language ETC. I work on IT and my hobby is baking. 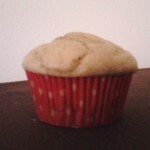 Since few months ago, I’ve started to bake several typical American desserts like apple pie, cupcakes or cheesecake.